Mushrooms are important decomposers. The fungi produces spores that later create hyphae. There is a biological network of hyphae, called mycelium. The mycelium helps to find nutrients for the mushroom. 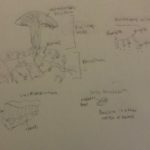 Mushrooms are part of a larger structure, fungi. Fungi decompose leaves, stems, and wood. This is organic matter that is a part of the O horizon, humus for soil. Organic matter is broken down. According to Dr. Stewert, mushrooms that grow on wood help to break the wood down into its “component chemicals.” There is also a symbiotic, mutual relationship between fungi and plants. Plant roots connect with fungi to form mycorrhiza, which effectively absorb nutrients and water. This allows for plants to have nutrients and fungi to have organic carbon. Its appearance is orange yellow with a white basal attached. This jelly mushroom grows on coniferous logs. The appearance is reddish color on the cap and yellowish or white gills. The cap is cushion shaped, with a center that is vase shaped. The stalk is white to yellowish white and is more thick toward the base. It’s fragile and has a smooth sticky feel. It tastes acrid. It tends to grow in boggy or coniferous areas and usually is on sphagnum mosses. It’s fan shaped, semicircular. The color of the cap ranges from pinkish to cinnamon-buff to gray and is “silky-hairy, zoned, radially furrowed to wavy.” The fertile surface varies in colors (looks layered) orange that fades into cream or cinnamon-buff. It grows on dead deciduous twigs and branches. It spreads all across America except the Rocky Mountains. It either grows in an overlapping formation or in rosettes. It is multicolored and can be silky, hairy, or velvety. It tends to grow on dead deciduous wood, in wounds, or conifers. 1-2″ wide and up to 1.3 cm high. It has a black to brownish color and usually comes in clusters. It has multiple small black dots on it. It feels like jelly. It is a wood-rotting species and tends to be found on branches of broad leaf trees. It is brownish red to grayish black in color. It is shaped like an ear and feels rubbery with folds. It is edible and medicinal. It grows on decaying wood. (The reason I didn’t put Crimped Gill is because I’m not completely sure that was the mushroom I found. It is described as hairy and the mushroom I found wasn’t hairy. I will keep looking).